WOMEN in RECOVERY – Surrender, ‘Only if you really want to’. Surrender. It is easily one of the most important aspects of spirituality. It is synonymous with letting go and allowing. The hallmark of surrender is the giving up of resistance. It’s a being transparent to energy that is passing through you. If surrender is so important, what is it, really? Let’s look at a variety of definitions from a number of spiritual teachers to make sure we’re very clear on what surrender is all about. The traditional sense of surrender includes a sense of loss and defeat, a place of weakness and inability, a choice to end the experience and exit the journey. In a spiritual context, surrender means something very different. It’s something applied while fully engaged with the experience rather than an end to it. 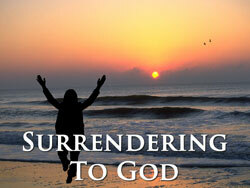 ”Let’s examine some spiritual perspectives of surrender. “What is the secret of your serenity?” asked a student. “Wholehearted cooperation with the inevitable.” said the Master. With surrender, passion is directed toward life itself-in spiritual terms, passion is the same as letting yourself be swept away on the river of life, which is eternal and neverending in its flow. The final fruit of surrender is ecstasy: when you can let go of all selfish attachments, when you trust that love really is at the core of your nature, you feel complete peace. In this peace there is a seed of sweetness perceived in the very center of the heart, and from this seed, with patience and devotion, you nurture the supreme state of joy known as ecstasy. This, then, is the path to love, although it isn’t the only path. Realize deeply that the present moment is all you ever have. Make the Now the primary focus of your life. Whereas before you dwelt in time and paid brief visits to the Now, have your dwelling place in the Now and pay brief visits to past and future when required to deal with the practical aspects of your life situation. Always say “yes” to the present moment. What could be more futile, more insane, than to create inner resistance to something that already is? What could be more insane than to oppose life itself, which is now and always now? Surrender to what is. Say “yes” to life — and see how life suddenly starts working for you rather than against you. The pathway to Enlightenment via radical truth is demanding and requires the surrendering of all belief systems. Only then does the Ultimate Reality reveal itself as the sought-after ‘I’ of the Supreme. To let go of the known for the unknown requires great commitment, willingness, and devotion to surrendering one’s faith to God. The experience of the presence of God is available and within at all times, but awaits choice. That choice is made only by surrendering everything other than peace and love to God. In return, the divinity of the Self reveals Itself as ever present but not experienced because it has been ignored or forgotten, or one has chosen otherwise. The spiritual aspirant, therefore, is wise to detach from all positionalities and opinions and be willing to surrender the ego’s temporary satisfactions for a higher goal. There are two ways of achieving surrender. One is looking into the source of the ‘I’ and merging into that source. The other is feeling ‘I am helpless myself, God alone is all powerful, and except by throwing myself completely on Him, there is no other means of safety for me’, and thus gradually developing the conviction that God alone exists and the ego does not count. Both methods lead to the same goal. Complete surrender is another name for jnana or liberation. Knowingness comes from surrender, letting go. Now, we understand that many of you, according to the definitions you have, many of you will label this as a loss of some sort of a lack of control of some sort and this is not the case. Surrender, if we may provide our definition, is the letting go of the concept of who you think you’re supposed to be and actually being who you are, because who you are is unlimited possibilities, and when you allow yourself to surrender to the idea and the experience that you were created in the image of the Infinite, which means that you are Infinite possibilities too, then the physical reality, which is only a mirror, can then reflect those unlimited possibilities back to you in the synchronicities as they naturally unfold in your physical day-to-day life. So surrender is actually acceptance of your total self, not the forsaking of your total self, as many of you have been led to believe through the definitions that your world has provided you with that only serve to limit you, and this is what we want to share with you and what we suggest you learn to give up, are those limitations. ” As Adyashanti would put it, surrender or suffer. Filed Under: MEN "Positive Action", WOMEN & RECOVERY, WOMEN that "Share in Positive Action" for Our World! Tagged With: A Celebration of Women, Anthony DeMello, David Hawkins, Deepak Chopra, Eckhart Tolle, God, Ramana Maharshi, spirituality, SURRENDER, surrender or suffer, Surrender to God, Take Action, women in recovery, WOMEN of ACTION™, women surrendering, women.